Brian Norwood Art - "Fortress on the Plains"
The images on this page show the construction of the metal sculpture "Fortress on the Plains". This life-size representation of a Boeing B-17 "Flying Fortress" bomber is intended to honor the men, women and aircraft that served in Hobbs and throughout the world. It stands 19 feet tall at the tail and stretches for 82 feet from end-to-end. It was constructed from two sheets of 10ft. by 40ft. 1/4 inch steel plate and supported with 6 inch square by 1/2 inch thick steel tubing. 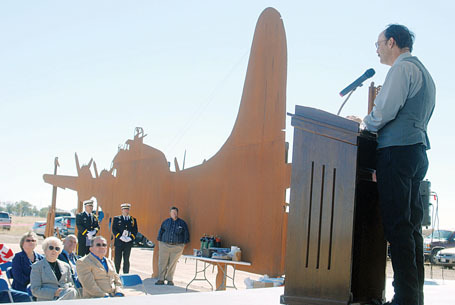 "Fortress on the Plains" was officially dedicated at the eleventh hour of the eleventh day of the eleventh month--Veteran's Day 2008! This sculpture was funded by the City of Hobbs, and I offer my deep appreciation and thanks to former Mayor Monty Newman; Mayor Gary Don Reagan; the Hobbs City Commission; Hobbs Industrial Air Park Board and its Chair, Marty Cope; Joe Dearing; Kevin Robinson; Jay Patton of the NM Wing Commemorative Air Force; Nolan Brunson; Doris Yarbro; Ray Battaglini of the Hobbs Chamber of Commerce, and Carl Baxley and crew of Bright Ad Sign Company. I couldn't have done it without your help! Hobbs Army Air Field was one of many training bases constructed by the U.S. Army Air Corps (later the Army Air Force and eventually a separate branch of service, the U.S. Air Force) during the Second World War. Originally a bombardier training base, its mission soon became that of training pilots to fly the Boeing B-17 "Flying Fortress". "It was a dream of mine to pay homage to the men, women and aircraft who served at HAAF, and I feel honored to have been given that opportunity...."
"Fortress on the Plains" was featured on the cover of the Winter 2008 issue of "Airpower History" the membership magazine of the Air Force Historical Foundation. To see "Fortress on the Plains", travel on New Mexico Highway 18 north of Hobbs. The sculpture sits 500 feet west of the highway, just north of the entrance to Harry McAdams Park and Ocotillo Golf Course. Need a life-size or larger airplane silhouette? Click here to contact me! Copyright © 2009 by Brian Norwood. All rights reserved.